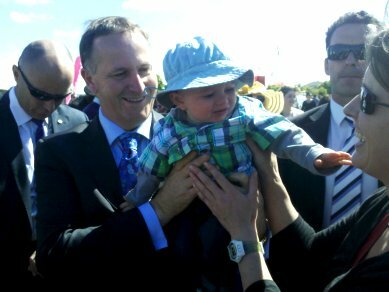 At least Finn wore a blue hat for the National party. Can you imagine if it had been Red. He might have said something like “Quick, grab that gay headed-baby. I’ll smile and show the world I’m pro-gay.” Thankfully though you didn’t put him in a red Man United top – he might have stolen Finn for the rest of the day, and sent pictures to David Beckham, killing two birds with one stone. Obviously his security detail we’re doing a great job, with one of them checking his facebook, tumblr, twitter, digg or whatever people do these days. Or perhaps he was just checking your blog in order to see if you’re a crazy stalker. The other security detail doesn’t seem interested. His brain was too busy thinking he looked tres cool. Perhaps I might have more respect for you if you groped him instead of Mr. Key. But in reality I’d probably just be envious. I’m a bit confused about why you think England is great, or where Genghis Khan comes into it. (I know why I think England’s great, but I have an excuse, it’s my home.) Also Sauron. I thought he lived in a place called Morrr-dorrrr, which is totally not New Zealand at all. But I’m sure you know what you mean, and isn’t that the main thing?